Less than 20 min. from almost anywhere in Seattle. ​or scroll down for detailed driving directions. Use Metro Trip Planner for convenient Bus Routes. Watch for new Light Rail service in 2020! 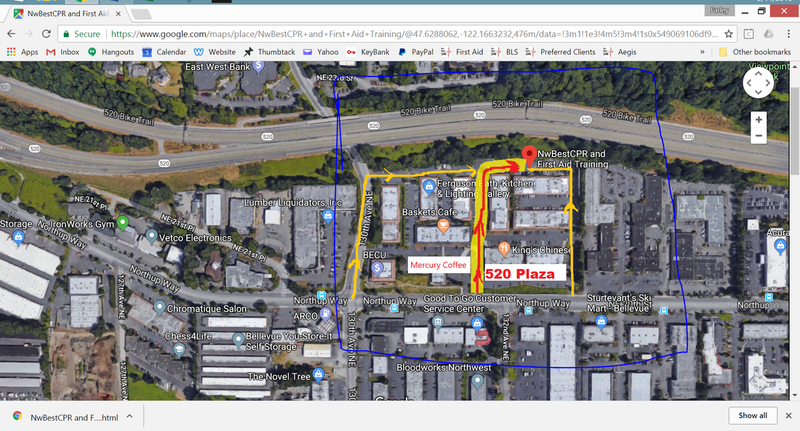 For more details about finding the Plaza 520 campus on NE 20th St. (Northrup Way) scroll down further. 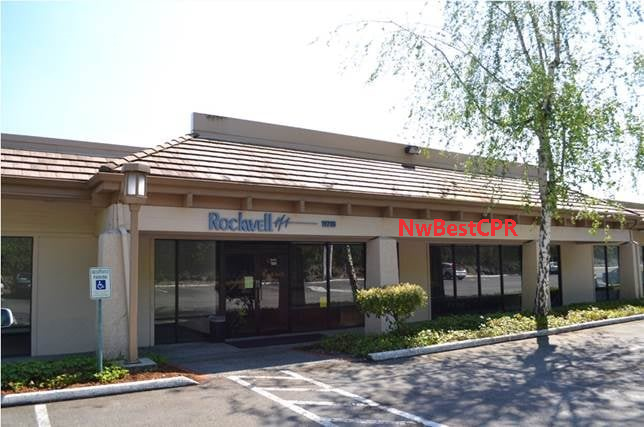 NwBestCPR classes are conducted at the Rockwell Institute located in the PLAZA 520 business complex on the north side of NE 20th St. in Bellevue. TURN NORTH INTO THE PLAZA 520 COMPLEX AT THE CENTER ENTRANCE. MERCURY COFFEE WILL BE ON YOUR LEFT. As you enter the campus driveway immediately LOOK for a LARGE MAP of the different building locations. Locate Building #13218 which is to the FARTHEST BACK and FARTHEST RIGHT (NORTHEAST) corner of the complex. As the driveway forks, follow the slight bend to the right and continue straight NORTH 100 yards past Arthur Murray Dance Studio, and then TURN RIGHT (EAST) into the final parking lot. You should be in the most north and east parking lot of the entire 520 business complex. Continue East until you see a RED VAN with signs for NWBESTCPR parked in front of the classroom door. Take either 140th Ave, 148th Ave, or 156th Ave, (NORTH) to NE 20th St. Turn left (WEST) onto NE 20th St. which will also be called Northrup Way. Plaza 520 will be on your right a few driveways past the ACURA car dealership. Follow the directions above to locate the classroom. Pass through the next stoplight (130th Ave. NE), then enter Plaza 520 on the left side of the street just past MERCURY COFFEE. Plaza 520 will be on your right, approximately 1 mile down NE 20th St. a few driveways past the ACURA car dealership. Turn right in front of MERCURY COFFEE.